Are you thinking Red yet? But for some reason, I am thinking you know what already! We host Thanksgiving and I love this holiday! It's the time to give Thanks and be with your loved ones. I cherish each holiday so much with my family to make sweet memories. already decorating for you know what. The night before is always fun. Garnish with fresh cranberries, orange, lemon, lime, and grapes. Reduce heat to low, and simmer five minutes or until cranberries pop. back of a spoon to squeeze out juice. Discard solids. Transfer cranberry mixture to a large pitcher. Stir in wine, brandy, and orange juice. Serve over ice, garnish with cranberries and fruit slices. Perfect for the month of November! 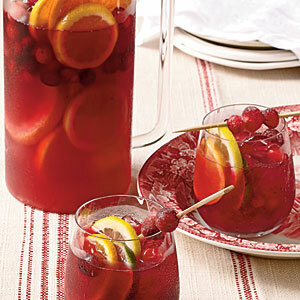 I am starting to think red, and this sangria recipe is a beautiful and great way to start off the holiday season. Thanks Claudia! MY name is Claudia too! Claudia Fabiana. Nice to meet you and I would LOVE to be on your blog roll. The followers link is in the top right column. I would love for you to try again. The page just might need to be refreshed. Or follow me on facebook if it still doesn't work. I love the Hotel del! We were there in August. Well hey Miss Claudia! I am TOTALLY with you on ALL of this!!! I love Thanksgiving and always put out some decorations for that holiday ... but for some reason, this year, it is REALLY hard not to jump ahead to that other color scheme! !